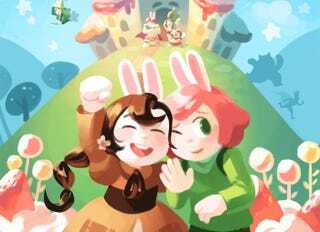 First Second announced this week that it will be releasing the first volume of Cucumber Quest in fall 2017, bringing the comic to a wider audience. By Gigi D.G., courtesy of First Second. Young Cucumber is a nerdy bunny on his way to magic school, something he has been looking forward to all his life. But just when he’s about to leave, he gets a letter from his pushy jerk of a father, telling Cucumber he needs to ditch school and fulfill his destiny as a legendary hero by stopping the fearsome Nightmare Knight. Cucumber is stricken, not to mention confused. After all, wouldn’t his little sister, the knight-in-training Almond, make a much better legendary hero? Cucumber and Almond travel through the Donut Kingdom and out into the wider world of Dreamside, where they meet a negligent oracle, a cowardly knight, and a host of oddball princesses, bakers, bandits, inventors, and monsters, not to mention the Nightmare Knight’s minions. I’ve been enjoying Cucumber Quest immensely. D.G. always surprises me with the way she calls out and twists common fantasy tropes, and I often find myself snorting out loud while reading her jokes. And she’s populated the world of Dreamside with characters who can be heart-warming and infuriating, but who are always fun to watch. Plus there’s the art, which features some of the finest color work I’ve seen in webcomics. So I was delighted to get a chance to talk to Gigi D.G. about Cucumber Quest and this new chapter in its publication life. io9: Where did Cucumber Quest come from? One of the things that I really love about Cucumber Quest is that it’s about a brother-sister team. What made you decide to make our main heroes siblings? Gigi D.G. : On the one hand, Almond’s character plays on the expectation that the designated hero’s little sister isn’t cut out for adventure. On the other hand, I just like portrayals of siblings who care for each other despite their differences. Cucumber and Almond represent opposite approaches to saving the world, but the adventure couldn’t proceed without them working together as equals. Cucumber Quest is a very metatextual comic. You often drive the plot forward by calling out silly tropes and plot holes that are common in fantasy epics. How did you end up using this as a storytelling mechanism? Gigi D.G. : Setting this comic against a typical “hero’s journey” backdrop provides a lot of opportunities for subverting reader expectations, which is just something I enjoy doing in my writing. This aspect of Cucumber Quest is frequently played for laughs, but bits like the Dream Oracle’s over-the-top negligence also serve as hints that much more is going on under the surface. Cucumber Quest has such a distinctive color palette, and it does a lot to set the tone for different portions of the comic. Where did you look for color inspiration? Gigi D.G. : My color process is intuitive, so I’ll typically “feel out” colors based on the mood of each scene. While most Dreamside locales tend toward the bright and cheerful, each major antagonist brings their own visual flair to the comic, with influences ranging from bold graphic design to film noir. It quickly becomes clear that there’s more to the Nightmare Knight than meets the eye. Did you build the story around this mysterious villain, or did his character evolve as you were developing the story? Gigi D.G. : By the time I began seriously planning the comic, I knew I wanted the Nightmare Knight to be more than just a “bad guy” to be defeated. I would say his personal feelings and experiences are as central to the story as those of the main protagonists. What excites you about seeing Cucumber Quest in print? Gigi D.G. : It would make me happy if children brought it to school and read it with their friends. Seriously, how much time do you spend thinking up food puns? Gigi D.G. : My loved ones are worried about me. Actually, that might have nothing to do with food puns. Cucumber Quest: Vol. 1 hits stores in Fall 2017.